We tend to stay away from kids entertainment venues. They can be loud, expensive, and overwhelming for my own family, who prefers a calm afternoon at the library to an evening at a pizza and games destination. We gave the Amazing Pizza Machine located in Omaha, NE a try on a past Wednesday afternoon because some friends of ours were headed up for a visit with their kids. Here is what we loved about this gaming/dining facility.. The premise of the place is easy: You buy a lunch or dinner buffet for between $5 - 8 for adults (less for kids), and you get all you can eat and drink while you're there. 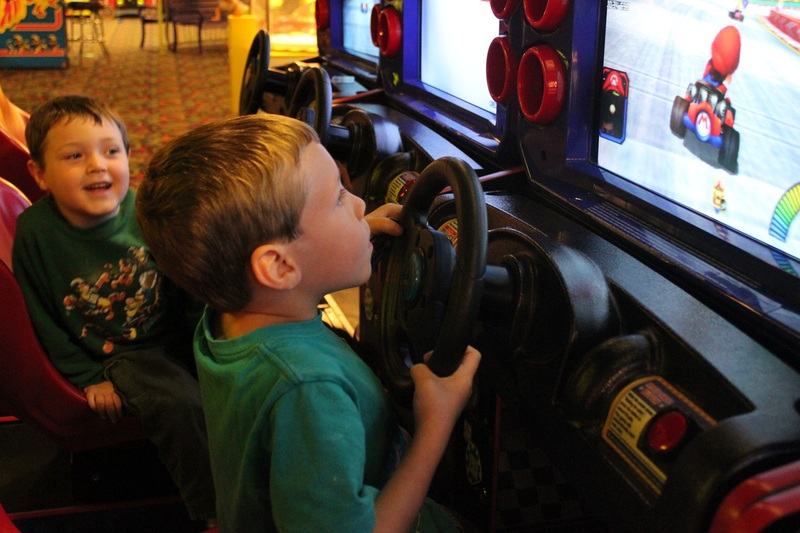 When you're done, you can play the games and ride the rides (which all cost additional.) You can not have admission to the rides and games without purchasing the buffet. Food offered was rather delicious. 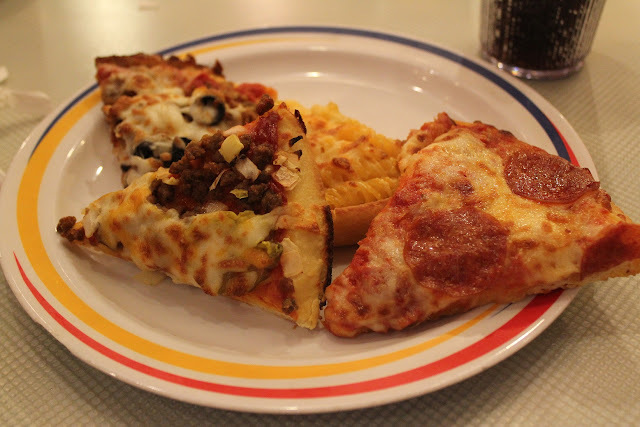 There were some strange choices for a lunch buffet, in my opinion, including a very cheesy hashbrown casserole, but everything was fresh and pleasing -- including a nice pasta bar and bread options. Cost of the place can vary. If you pay full price, it's expensive. You have to purchase a card to fill with credits towards the games and rides, and we could have easily spent $50 or more for our kids to do what they wanted. Luckily, our kids are younger, and they had access to the "7 and under" place for the little ones. It had a free play space with slides and tubes, as well as smaller versions of popular games (whack a mole, air hockey) that used half the points of the larger games to play. Additionally, there are promotions throughout the week to cut the cost. We were there on a Wednesday before kids got out of school, so the rides were half the cost of points -- stretching our dollar much further. 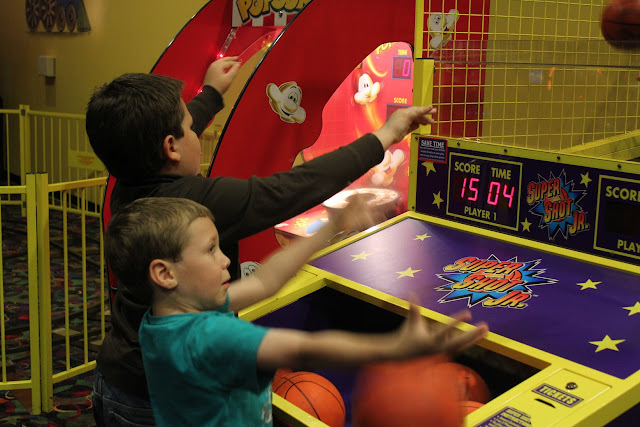 Also, Tuesdays offer one hour of unlimited play of the games and point machines (not token machines) with each purchase of a buffet. You could spend about $5-7 per person and really have a great time! Unlike the other popular pizza and rides place, you have to buy food for your time there. It's worth it, in my opinion, however, because the food is good, and the rides and games are appropriate for all ages -- not just tiny kids. If you're in the Omaha area, stop by the Amazing Pizza Machine. On a quiet afternoon, it's not too overwhelming... and really fun! Find out more at the official website where you can sign up for emails with savings offers or follow them on Twitter and Facebook!